You can choose to add a pre-mixed case to your basket or you can even mix your own case by adding wines to your basket and checkout! If you're having trouble with the website, give us a call on 1300 898 677 and we'll place the order for you. We have 6, 12 and 15 bottle boxes in our warehouse, so feel free to mix up a case of your favourites (One of this, two of that etc). If you order lots of bottles, please be aware that we will fit the wines into the fewest number of boxes possible (better for the environment and all that!). For example, if you order two six packs, you'll receive one box with 12 bottles in. Cases can also arrive separately as we try and get your wine delivered as quickly as possible. How much does delivery cost and when will my wine be delivered? We deliver REALLY FAST (next working day) to Sydney, Melbourne and Perth metro areas, and QUITE FAST (two - four business days) to Brisbane, Canberra and Adelaide... Just get your order in by 3pm and we'll get packing! If you're an Angel in Sydney or Melbourne it's not only fast, it's also free! For all other areas within Australia, freight costs will vary. You can use our delivery calculator to see how long delivery will take and the delivery cost. Unfortunately we don't ship to Northern Territory...sorry! We ship our delicious wines to most Australian addresses - use our delivery calculator to check your postcode. Unfortunately we can't deliver to PO Boxes and we do not ship to Northern Territory...sorry! Why don't you ship orders to the Northern Territory? Due to Northern Territory Government legislative changes to the Liquor Amendment Bill in order to regulate the sale, provision, promotion and consumption of liquor within the Northern Territory, we no longer ship to this region....sorry! Can you ship to a business? We love shipping to your work address. Deliveries usually take place Monday - Friday 8am-6pm so this is good way to ensure you get your wine first time. Plus it's a great way to show your work colleagues that you are supporting Australian winemakers! Who will deliver the wine? Most of you will have your wine carefully delivered by our friends at Fastway Couriers. We work really closely with Fastway to ensure the delivery experience is as seamless as possible. Regional areas may be serviced by Australia Post and in WA it could be a number of different carriers (all of whom do a great job!). What happens if nobody's there to accept the delivery? When you place your order there is a space for delivery instructions that will be printed on the label for the driver. We are happy for the driver to leave your wine in a safe place if you're not home so just be clear in your instructions to avoid going thirsty! If there isn't anywhere safe to leave your order, you can also tell us not to leave the wine without a signature. Just pick this option at checkout. Can I have the wine shipped to somebody else as a gift? Yes, but make sure the person is over 18 and that they'll sign to receive it. We can also include gift messages. During checkout, we'll verify that we can ship the wine to the address you're sending it to. If there are any problems, we'll let you know. No, sorry. You need to sign to accept the parcel. What is this $0.01 charge on my credit card? This is just an authorisation so that we can check your card and mitigate the risk of fraud. The $1 is never billed and will disappear after a couple of days. If you want to cancel your order for any reason give us a ring at 1300 898 677 as soon as possible and we will attempt to cancel it for you and give you your money back. N.B. Because we try to deliver very promptly, it isn't always possible to cancel the delivery. The warehouse team moves as fast as lightning! But you can refuse to accept the wines when they arrive (just tell the delivery person to return the wines to sender). We’ll refund your money when the wine arrives back at the warehouse. What can I do if I don't like the wine? If you don't like a wine, or it's corked or damaged, then we'll give you a full refund or a credit to your account. Email us at chat@nakedwines.com.au or call us at 1300 898 677 and we'll sort it out for you within 30 days of your order. N.B. If you have several bottles of the same wine that you want refunded, please leave them unopened as we'll come and collect them. We'll let you know when you get in touch with us. How do I find the right wines to buy? Still not sure what to go for? Give us a ring on 1300 898 677 and ask to speak to one of our friendly Customer Happiness Managers - who will customise a case to match YOUR taste buds. What do I do with this voucher? Redeem your voucher by clicking here. If you have additional questions, there's a whole section of the FAQ especially devoted to your voucher. Why do you have a red circle against each wine with a percentage in it? This is our “buy it again” rating – a quick and easy way to see how popular a wine is. The percentage is the number of customers who’d definitely come back for more, over the number of customers who have left a rating. The rating starts afresh every vintage, to help you identify a particularly good year! You can hover to see how the previous vintages were rated in comparison. After you've tried a wine, remember to give it a thumbs up (or down) to let us know whether you'd buy it again. It helps us to figure out which wines to buy more of and to tailor the wines we recommend to suit your preferences. Do you include ratings from new customers as well as Angels? Yes – whether you're a Naked old-timer or you've just placed your first order, we'll include your rating against the wine. An improvement we made in March 2018 was to only include ratings from customers who independently add wine to their case, versus those who buy the wine as part of a premixed case. Our pre-mixed cases are (typically) the go-to place for new customers who've never tried our wines before - and our ratings are designed to guide Angels who need help building their own case. So it makes more sense to reflect the thoughts of those in the same boat! Whether you build your own cases, or leave it to us - please continue to rate your wines. It's a great way to remind yourself what you like, it helps us to decide where to invest your hard-earned cash - and it gives your winemakers an invaluable steer on what's hot and what's not and where to improve. Who are the Angels mentioned all over the site? Angels don't just cut out the middlemen, they make them look ridiculous. We spend our lives finding the talented winemakers BEHIND the famous names. Angels support these winemakers, so that they can make wines the way they should be made, without compromise. And in exchange, our super-grateful winemakers give the Angels preferential prices. 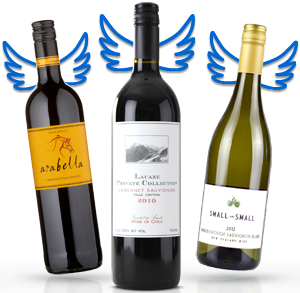 Angels support Aussie winemaking talent by topping up their Angel accounts with $40 a month to be spent on wine. In return, they receive wholesale prices; free wine and a whole lot more. You can become an Angel by signing up here. What do I get as an Angel? Each month you top-up your account with $40, yours to spend whenever you like. This isn't a membership fee and we'll never send you unsolicited wine the way most wine clubs do. Your money builds up until you want to buy some wine. Or get it back if you don't. How does any of this affect the wine? Basically, our winemakers don't waste money on stuff that you can't taste like marketing or high interest rate loans. When Angels put money aside in their Angel accounts, we can turn around and invest in winemakers around the world eliminating their need for the banks. Angels simultaneously provide the money to make the wine and an end consumer to drink the wine! That means our winemakers waste no money on marketing or sales since we already know the Angels will snap it all up. Every cent the winemaker spends goes into the quality of the wine to make it taste better. No money goes to the stuff you can't taste. Well aside from a little bit to keep the winemaker and Naked Wines in business. Updating your card details is easy. Just head to the 'My account' section and click on 'Cards' in the blue drop down menu at the top of the screen. Cancelling your Angel status is easy (although we’d rather you didn’t!) You can cancel at any time by logging in, then selecting ‘Account details’ under your name at the top of the website, followed by ‘Angels Account’. Or call us at 1300 898 677. Either way, we’ll cancel your account and refund any unspent top-ups you have made. Is this a wine club? If you're into wine, you probably know that "wine club" has come to refer to a very specific business model where customers pay a certain amount per year and a company (often a winery) sends them regular shipments of wine. We aren't doing that. 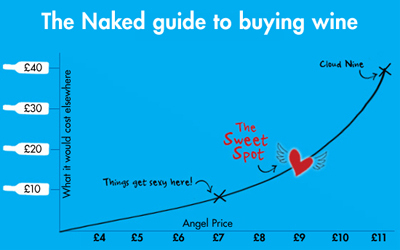 Instead, Naked Wines customers put money in a separate trust fund over the course of the year. And they can come and shop at the site with that money as much or as little as they want. They can assemble cases however they like, only have wines delivered around the holidays or before their birthday or whenever. If you're looking for a company to regularly send you unsolicited wine, we're not it. But in the more general sense, we are a group of people who really enjoy wine. So if "wine club" just meant a club that likes wine, we'd be that. Shouldn't I just buy direct from the winery? Buying direct from wineries is a great way to support already existing winemakers. But you'll pay a lot more without necessarily benefiting the winemaker. Being an Angel means you're financing new winemakers and creating new projects, and you tend to get much more bang for your buck because of that. Can I find these wines at a bottle shop? Virtually all the wines on the site are exclusively sold through Naked. If you manage to find similar wines or wines made by the same winemakers or wines made from the same fruit, they will typically be much more expensive. Because Angels finance these wines and promise to drink them all up, winemakers are able to sell it at the true cost without marketing costs and other worries. Can I get my money back if I don't enjoy the wines? N.B. If you have several bottles of the same wine that you want refunding, please don't open them as we'll come and collect them. How do I organise a refund? Call us on 1300 898 677 or email us at chat@nakedwines.com.au - and we'll get it all sorted for you. How do I shop on this site? We have tried to make the site navigation as simple as possible. For example, you can find mixed cases under the case tab or mix your own case through the wines tab. Still not sure what to go for? Give us a ring at 1300 898 677 and ask to speak to one of our friendly customer happiness managers - who will customise a case to match YOUR taste buds. What's social about this site? We like to see a lot of chatter on the website. We rely on feedback from customers so we can grow and improve - so please don't be shy! Our winemakers in particular love hearing what you think, so when they're working on new vintages, they know what our customers are looking for! Rate your wines and post reviews via your 'Naked Me' page (click on the 'wines' tab within 'Naked Me'). Get to know other Naked customers and the team by joining one of the Naked Discussion Groups, OR create your own discussion group! Chat to the winemakers on their personal profile pages (click on the 'Winemakers' tab to access them). You can also 'buddy' up with other customers so you can share reviews etc. To do this, click on their name and you'll be given the option to 'follow' them. Every time they write a post, you'll then get an email alert to hear what they've got to so. N.B. You need to be registered and logged-in to post on the site. TIP: The BEST place to start is to join our Naked Newbies group and introduce yourself! How does Naked select winemakers? We want talented winemakers who can make great wine without wasting time or money on marketing. Many of them come to us. Why do winemakers work with Naked? Since we finance everything and sell everything we finance, our winemakers don't have to worry about funding, marketing or sales. Zero risk and more time to concentrate on making great wine tend to be pretty convincing arguments. How can I work with Naked? Just drop us an email at chat@nakedwines.com.au. We're looking for talented winemakers who have sussed out great opportunities to make wine and need help with the financing and sales. So tell us what you've done that makes you special, what opportunities you've found, and give us an idea of how we can help you. What do I do with my voucher? If you received a voucher from one of our partners, here is some additional information that might help you out. What on earth is this voucher I received? We know that trying a new wine can be a scary experience. And we need to earn your trust. So we try to make the first case as affordable as possible. We'll also try to make the choice easy for you by recommending a case of wine. The recommended case has a good panoply of wines that represent the diversity and quality of our range (and they are also our customers' favourite wines). That said, if you want to build your own case, feel free to do that under the Wines tab of our website. Note that the voucher you got should say exactly how much money you get off and it will probably have a minimum spend on there too. Like $50 off of a purchase of at least $109.99. If you build your own case, make sure that you hit the minimum spend amount detailed on your voucher or you won't be able to claim the voucher. For full voucher Terms & Conditions, please click here. How many bottles do I need to order at one time? If you're still not sure what to go for, just give us a ring at 1300 898 677 and ask to speak to one of our friendly customer happiness managers who will help you make a case that fits your taste buds.